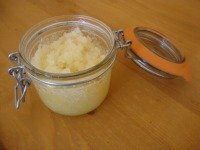 Why make your own natural bodycare products? Have you ever had a good look at the ingredients list on your bodycare products, and wondered what you were actually putting on your body? 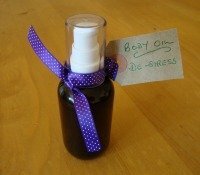 So why not have a go at making your own lotions and potions? You can save money, have lots of fun and have the satisfaction of knowing EXACTLY what ingredients are in your very own products. Not forgetting as well, the HEALTH FACTOR! I have been making natural handmade soap for many years now, and would never be without my own stock - I cannot remember the last time I bought a bar of soap! I love the fact that I am using my soap that I know is good for my skin health. So I began to think about my body lotions and hand creams......surely I could create my own, surely it couldn't be that difficult! 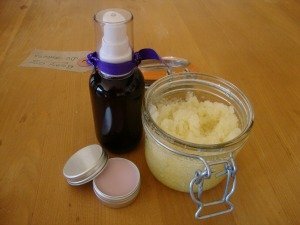 I really wanted to make my own natural bodycare products. And so it all began.....I did some research and discovered that there were some lovely body and spa recipes that I could start with. So here is a selection of easy to follow recipes, similar to those that started me off on my journey of creating my own natural bodycare products.. Create your own spa experience at home with sugar and salt scrubs.........they could not be easier to make! Regular exfoliating leads to healthier skin......it will feel softer and you will be positively glowing. Salt and sugar are such simple, but wonderful, natural exfoliants and they don't leave any harmful residues. Salt softens the skin and has detoxing and antiseptic properties. Sugar is a natural source of glycolic acid which helps condition and moisturise the skin. The only other ingredients you need are a carrier oil (or a blend) and some essential oils to create a wonderful aroma. The ingredients are easy to find and inexpensive to buy. The scrubs can be as simple or creative as you like........the choice is yours. Use 2 parts salt or sugar (or both) to 1 part oil. For salt scrubs use fine to medium grains as you might find large grains sharp and scratchy. For sugar scrubs demerara sugar is a good choice, with its medium grains and lovely honey colour. It is also softer than granulated sugar and smells gorgeous! Try a half sugar half salt mix for a change. Or how about Epsom salts or Dead Sea salts. Place all of the ingredients in your jar and stir with a spoon.......simple as that! To use your scrub, scoop out a generous amount onto a flannel or bath mitt and massage gently into the skin using a circular motion. You can rub harder on your rough areas such as heels. Make sure you rinse off thoroughly......and then GLOW! As an aromatherapist and massage therapist, I have always been interested in trying out different carrier oils and essential oils......and so making my own bath and body oils was a very natural progression, and it is so easy to do! Taking a long soak in a bath with beautiful aromatic oils takes a lot of beating......you can literally feel the tension melting away, body and soul. The oils help moisturise, soften and nourish your skin, and your muscles love it too. If you don't have a bath, then using your body oil is a lovely way to moisturise after a shower.....just massage the oil into your body while you are still wet and let your skin absorb the oil - it doesn't take long! You can also use this as a massage oil.......anytime of the day. You can choose whether you want your body oils to soothe and relax you or rejuvenate and energise you. Or perhaps you just need pampering and de-stressing.....life can be so hectic these days. Put all the ingredients into a small jug and mix well. Pour into your bottle and put the cap on. It's ready to use whenever you want! A few simple ingredients....... and you can easily make healing and protecting balms and salves. Simply melt together a combination of butters, waxes and natural oils in a bain-marie (double boiler) and add some fabulous essential oils. Balms and salves have no water part at all, which means that you don't have to add a preservative. However, it is advisable to add some antioxidant Vitamin E oil (at 1% of the recipe) to stop the oils from going rancid. There are a fantastic range of oils, butters and waxes available, so probably the hardest decision to make is which to use. They all have specific therapeutic properties, so this is one way of basing your selection. There are also a whole range of balms you can create, from foot and hand balms to body and lip balms. As I am a reflexologist, I started with a foot balm......but the choice is yours! In a double boiler, gently melt the beeswax and coconut oil with the olive oil. Add the Vitamin E oil and essential oils. Pour into container and allow to cool, covered with paper towels. Put lid on when cool.